Clean, wash and soak Basmati rice for 30 minutes. Heat ghee and oil in a pressure cooker, add the whole garam masala, mustard seeds, cumin seeds, dry red chillies, chana dal, urad dal to it. When the seeds crackle add the chopped onion, ginger paste, curry leaves n saute for few minutes. Add a pinch of hing to it. Then add the tomato puree and cook till the raw smell goes and oil leaves the masala. Add haldi and garam masla to it. Then add the soaked rice and toss to mix well. Add 2 cups of hot water to the rice and salt to taste and close the lid. Cook on a high flame for 2-3 whistles. Then switch off the flame. When pressure subsides, open it and fluff it with a fork. Garnish with the fried cashew nuts and raisins and Serve hot with any gravy item or raita. Enjoy your Spicy n yummy Tomato Rice !!! NOTE :- 1. I have used raw rice and directly cooked in pressure cooker for early cooking. 2. 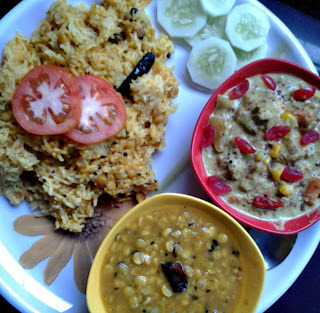 Anyone can prepare this dish using cooked rice with the same process in a kadhai. 3. One can make this dish without onion in any vrat or fasting day, only with ginger paste.